A new 200-litre multi-use Traylink sprayer assembly has been specially designed by Silvan Australia for use with small tractors and mule-type vehicles. The new line of Traylink sprayers suits the requirements of small acreage property owners, larger farmers, councils and park managers as well as grounds maintenance contractors. The 200-litre capacity Traylink sprayers can be used as a complete compact slip-on skid mounted assembly of tank, pump and delivery system or as a linkage unit for small tractor attachment. Offering a choice of twin Hypro boomless nozzles, the unit can spray a swath up to 9 metres in width at a flow rate up to 15 litres a minute while on the move. 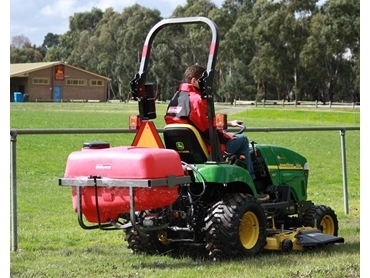 These features make the sprayers ideal for sports grounds, paddocks or similar larger areas and contained spaces that cannot be reached with a traditional boom. Alternatively, the multi-use sprayers can be used with a Silvan Spotjet spray lance and a 6-metre length of 8mm internal diameter hose. This option makes it ideal for spraying under fence lines, trees, along road sides or similar hard-to-reach places without moving from the driver’s seat. The Selecta Traylink sprayer is ideal for pesticide spraying, insecticide spraying, herbicide spraying or fertiliser spraying applications. The 200-litre tank is matched with a high capacity 12-volt pump capable of 20 litres of open flow. As a 12-volt DC powered pump, it is also ideal for small vehicles without a PTO capacity. A graduated regulator and a pressure gauge are supplied with the boomless sprayers for easy control and continuous agitation of the spray materials. The two manual section valves offer choice of twin Hypro boomless nozzles or the attachment of the spray lance with one port closed off. Silvan Australia’s Selecta product manager Greg Everett says that the 200-litre sprayer is designed as a professional, compact unit that enables high performance boomless spraying and spot spraying in the same unit.